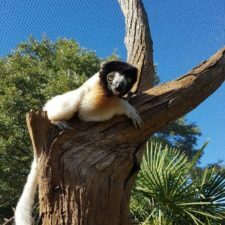 Over the next couple of months, I’ll be sharing stories and travel tips from my trip to Madagascar in August and September 2016 to inspire and inform your travel dreams! Traveling south on the RN7, I stopped in Antsirabe, Ranomafana, Kianjavato, and Ambalavao. 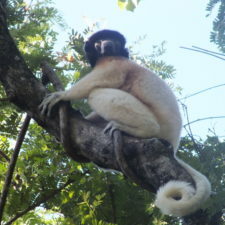 Visiting several Lemur Conservation Network members as well as community reserves, national parks, and artisan workshops, I gained insight from our members on the ground as well as local guides and villagers. Like most visitors to Madagascar, I began my travels in the capital of Antananarivo. 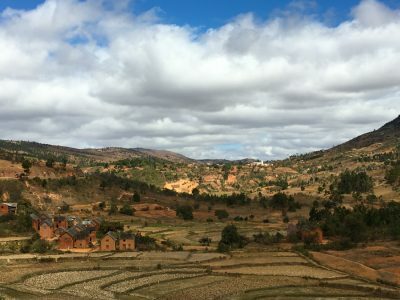 My time for this trip was limited, so I headed out of Tana the following morning en route to Madagascar’s third largest city: Antsirabe. Small villages dot rice field landscapes as you drive south from Antananarivo through the rolling hills of Madagascar’s Highlands. Photo by Lynne Venart. Antsirabe is about a 3 1/2 hour drive down the RN 7 from Antananarivo, passing by barren hills, rice fields, picturesque small villages, and roadside towns with local Malagasy out and about — shopping on market day, playing baby foot (foosball), and going about their daily life. You can view some Merina tombs from the road and stop for pictures as often as you wish. This road south to Antsirabe is very good and paved, though it winds with lots of twists and turns, so be sure to wear motion sickness wrist bands if you think you may have trouble. My driver Zina tells me that children in many of these small villages walk two hours each way to school, so their classes often run for only part of the day. En route, Zina suggests we visit Lake Tritriva, which is just outside the city of Antsirabe down a bumpy dirt road about 15 km past the THB brewery. Antsirabe itself is known as the rickshaw capital of Madagascar, and this is very evident as we pass dozens of foot- and bicycle-powered rickshaws—and tons of people on bikes—while making our way to the crater lake in the afternoon. Witnessing the Joy of a Famadihana! August is winter in Madagascar which means that many families in the Highlands are celebrating a famadihana. This is a traditional bone turning ceremony, where family members turn the bones of their deceased loved ones. They take the casket out of the tomb in a ceremony, and then celebrate by carrying the casket down the road while singing and dancing, ending the walk with a big party filled with food and dancing. Sure enough, on the way to Lake Tritriva, we pass a joyful famadihana! The celebration passes us quickly but it is amazing to witness such an important part of Malagasy culture in the Highlands. 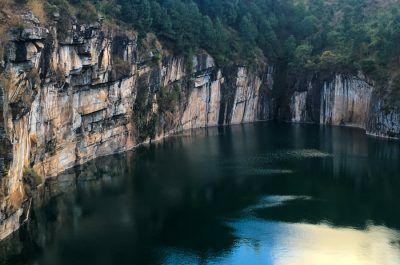 The sheer rock walls and beautiful water of Lake Tritriva. Photo by Lynne Venart. The crater lake is a bold aquamarine blue. It is a deep volcanic crater with sheer rock cliff walls and trees lining the top. Hery is my guide, and his English is very good. 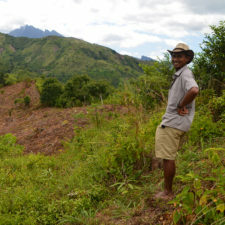 He also takes tourists on canoe trips west of Antsirabe, and on multi day trekking through rice paddies to other towns. Three months ago, they started offering ziplining across the lake. I see two ropes installed — one high and one low. 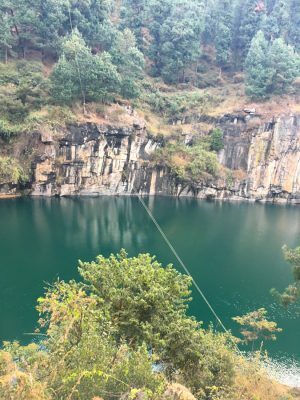 Though I didn’t see anyone actually ziplining, Hery tells me you use helmets and harnesses to cross the lake, and the lower zip line ends in the shallow water by the lake’s edge. Hery says he has tried the lower one and it is great fun, but the higher one makes his heart hurt. I like that Madagascar is offering adventurous options like this to attract tourists (like Costa Rica does), but Hery says this is considered a sacred lake. People come here to ask for prayers and make an animal sacrifice to their ancestors against a rock he shows me. There’s also a Romeo and Juliet style legend about this lake, that a young couple came here and committed suicide hundreds of years ago because they couldn’t be together. The zipline! At least if you fall, you land in the water, right? Lake Tritiva seems to hold much significance for the people in this area, so it is a shame that they feel the need to offer ziplining to attract tourists. However, there is also a new generation of Malagasy with big dreams to follow, and highlighting the beauty of the area with fun activities seems like a great way to attract new visitors. Surprisingly there are pine trees here. 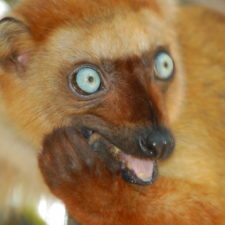 They are not native to Madagascar, and I later learn they are wreaking havoc on the ecosystems. As their reforestation efforts, the Madagascar government is planting pine and eucalyptus trees — both of which grow very fast, are not native to Madagascar, and harm native species. Hery tells me there is a church in the village that requested to cut down native trees for building materials to extend the size of the church. Though it is forbidden to cut trees here, they were granted permission. Now, the school children plant trees every year (likely invasive pine and eucalyptus) to replace these trees in exchange for a small subsidy for the school from the government. Hery also explains that it is tradition for families in this area to have seven girls and seven boys. He states that parents now struggle very much and can not raise that many children. While they are now having less children, it is still common to have seven total children — a family size that is still difficult to support. The farming villages surrounding Lake Tritriva, where many families grow barley for the THB Brewery. Photo by Lynne Venart. 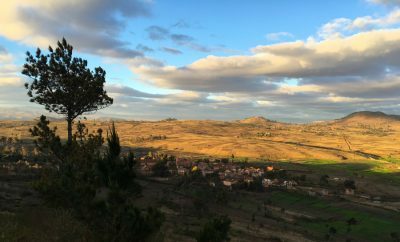 Hery says this area — the central highlands surrounding Antisrabe — is the coldest of all of Madagascar so the crops do not grow year round, like they do somewhere warmer like Ranomafana. They grow barley for the brewery as well as vegetables like carrots and traditional rice fields. Sun is setting as we leave lake Tritriva and I learn why driving at night is not recommended here. I had always assumed it was because of bandits and danger. That may be the case, but on the outskirts of Antsirabe and on this road in particular, it is largely because you can’t see the potholes (or dirt holes as the case may be), and you can’t see people walking, on bicycles and on rickshaws. Cars do not always have full lights on, and street lights do not exist. It’s quite considerate actually to not drive at night when you are in a 4×4 and most people are on foot and bicycle! We make it to the hotel without incident, and I look forward to what adventures the next day will hold. * At the time of my trip, 10,000 ariary was roughly equivalent to $3 USD.